Jane Richard (center) shoveled dirt Wednesday along with other members of her family and public officials at the official groundbreaking for Martin’s Park at Smith Family Waterfront. 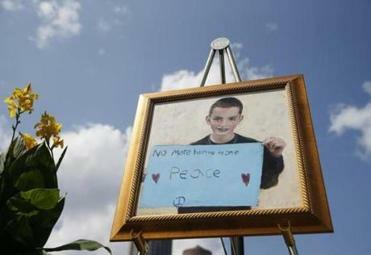 Before he became the youngest victim of the Boston Marathon bombings in 2013, Martin Richard was an 8-year-old who loved to play. His zeal for the outdoors, along with his spirit of inclusivity toward children of all abilities, was the vision behind Martin’s Park, which was celebrated in a groundbreaking ceremony Wednesday by hundreds of people who gathered outside the Boston Children’s Museum. “This park, and all it stands for and represents . 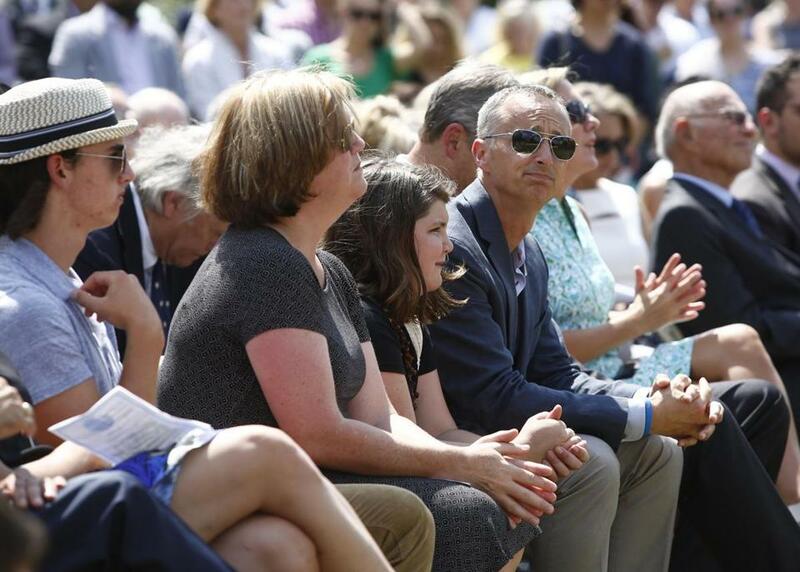 . . [is] about taking perhaps the darkest and most terrible and horrific experience anybody could possibly imagine and finding light, and hope, and positivity, and a future on which you can build something beautiful out of it,” Governor Charlie Baker said at the event. 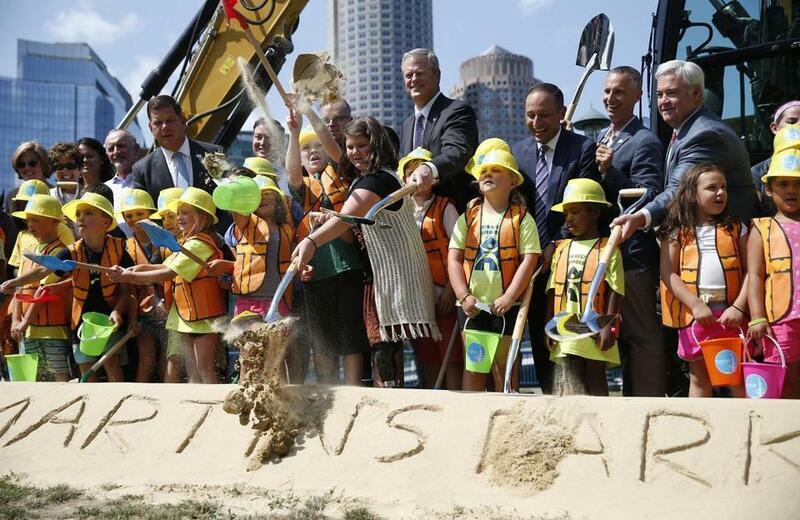 Joined by Baker and Mayor Martin J. Walsh, dozens of children with toy hard hats, buckets, and brightly colored shovels broke ground on the project shortly after 2 p.m., digging into a mound of dirt with “2017 Martin’s Park” etched on the front. Though the process typically involves just a toss or two of dirt, the littlest groundbreakers turned the task into a celebration, already enjoying the park as they dropped their shovels and grabbed fistfuls of dirt, throwing it around like confetti. A painting of Martin Richard hung Wednesday at the official groundbreaking. Throughout the event, speakers referred to Martin’s spirit of peace — best captured in the photo of him holding a sign with the words “No more hurting people. Peace” that was widely circulated after his death. Bill Richard, Martin’s father, said the park will be a place where all kids will have the opportunity to learn and play together without prejudice. “Despite the seemingly never-ending chaos and senseless violence . . . in our lives, today is undeniable proof that good will always triumph,” Richard said. Martin was one of three people killed on April 15, 2013, when two bombs exploded near the Marathon finish line. His younger sister Jane, who was injured in the bombings, also spoke at the groundbreaking. She recalled how much she loved to play with Martin, and looked forward to the new park. Vicky Shen, who was one of Martin’s track and field coaches and now serves on the board of directors of the Martin Richard Foundation, said the location is perfect because it’s an open space that is underutilized. “Having it become an amazing park is a great service to the city of Boston,” she said. The park, which is scheduled to open during the fall of 2018, will include slides, a basket swing, a play ship, nature trails, and more, with north and south play areas connected by a raised bridge. The project is overseen by the Boston Parks and Recreation Department. 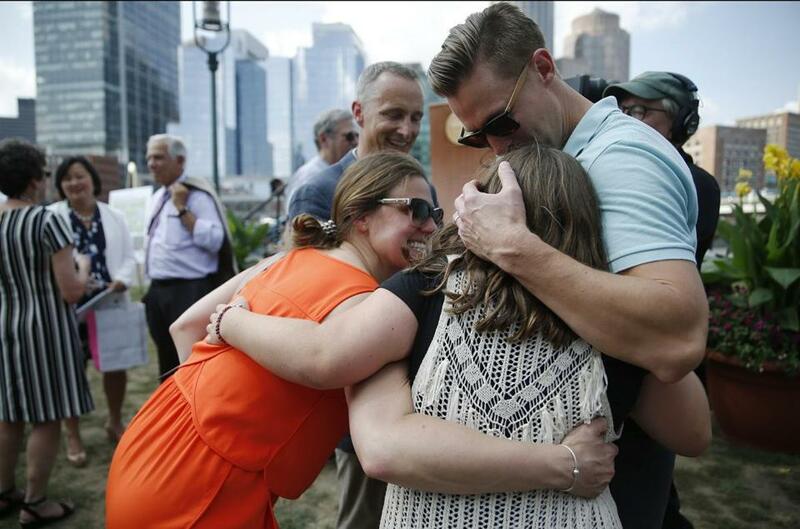 Jessica Downes (left) and Patrick Downes (right) embraced fellow bombing survivor Jane Richard on Wednesday. 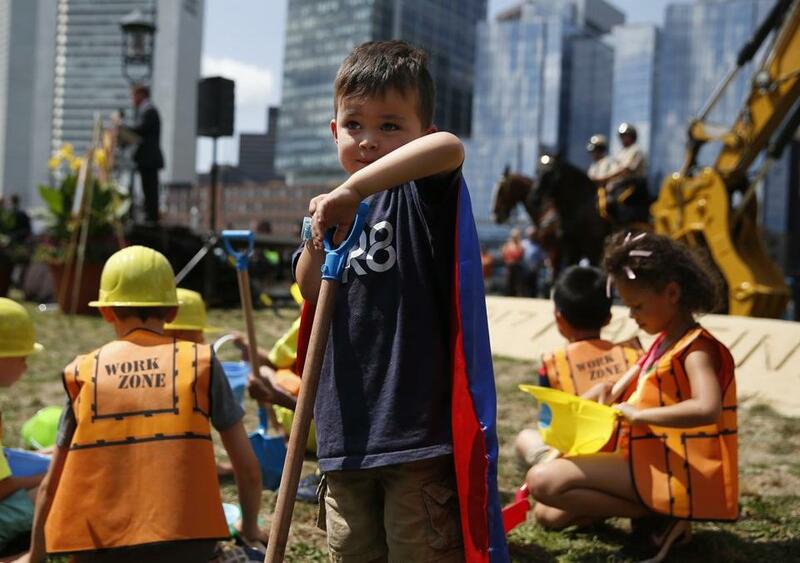 Max Shen, 3, of Sutton leaned on his shovel as Mayor Martin J. Walsh spoke at the official groundbreaking. The Richard family, (left to right) Henry, Denise, Jane, and Bill, sat together at the official groundbreaking. Kiana Cole can be reached at kiana.cole@globe.com.